In search of a sportsbook with huge esports market offers? Then Betway might be just what you’re looking for! The company was founded back in 2006 and has become a real favorite among bettors. And you can tell that they’ve been putting in hard work creating the ultimate esports betting experience. They’re involved in the scene generally, which includes being proud sponsors of Ninjas in Pyjamas and several prominent Twitch streamers. Occasionally, they also host events, such as ‘Fight Night’ where top-tier esports teams battle it out. Create an account today and get a €/£30 free bet when you bet €/£10! Betway understands how popular esports actually is and they’re offering one of the largest selections of today. You surely won’t be disappointed, as a new customer, you’ll get €30 in free bets when you deposit and bet €10. The free bets can be used on esports as well on more traditional sports. Explore an entire section dedicated to esports with hundreds of odds and a blog filled with helpful tips and strategies. One thing we’re missing is live streaming, which could be a useful feature while betting live. Overall an excellent choice for those who are looking to bet on League of Legends, CSGO and other esports games! Learn more about Betway by reading rest of the review below. A generous bonus can get you the start that you need, and there sure are lots of bonuses to choose from out there. This is where Betway stands out; they offer one of the best bonuses on the market. Claim the bonus by using the links on our site. Certain terms and conditions apply; further information provided below. There’s no need for complicated bonus codes or such, simply just bet €10 to be credited with €30 in free bets. The free bets can be used for CSGO, League of Legends or any other esports title. You can even switch it up and bet on traditional sports if that’s what you prefer. Betway distinguishes themselves from other sportsbooks in various ways. One example is by running contests and giveaways, and it’s often completely free to participate. All you need to do, to stand a chance of winning a prize, is to follow them on social media like Facebook, Twitter, YouTube etc. They have previously handed out expensive csgo skins and signed NiP mouse pads. So, there’s some pretty sweet stuff you could potentially win just by following and subscribing to their social media channels. This whole feature makes this sportsbook unique and definitely adds to the overall value you get as a player. Betway, the brand and website, is managed by Betway Limited, a company based in Malta. The company is licensed and regulated by the Malta Gaming Authority, registered with I.B.A.S and is also a member of ESSA. Meaning their business operates in a legal manner and ensures a safe and secure gaming environment. A variety of products is offered – Sports, Casino, Vegas, Bingo and Poker. This package of entertainment provides unique experiences to a broader audience. Try their sportsbook with over 30,000 sports betting markets, everything from Football, Ice-Hockey and Boxing to Esports. Access the sportsbook directly through a web browser or download their Sports App for Android and iOS. The casino is stacked with 500 games, and new games are always being added for you to enjoy. Microgaming, their choice of gaming software, guarantees the most innovative and thrilling games on the market. And the fun doesn’t end with the broad range of games, to get you started, they offer you a €1000 bonus. As you probably can tell by now, they’ve put a lot of effort into assuring their customers a pleasant stay. 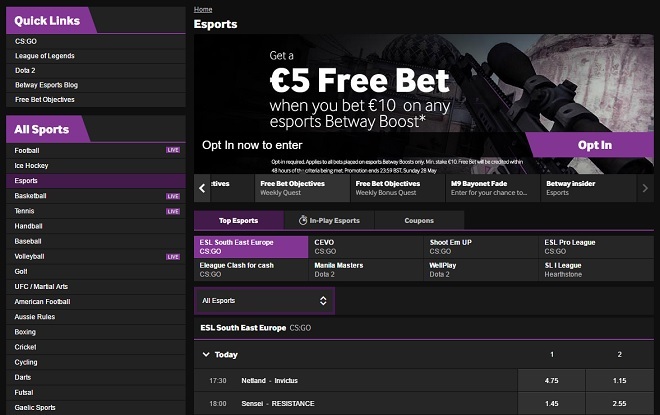 Betway has certainly taken esports betting to a whole new level and will just keep improving. The collaboration between Betway and the famous esports organization Ninjas in Pyjamas began back in September 2016. Content rights, branding opportunities and more is part of the six-figure contract deal. You can already see how the partnership with NiP have changed a few things, such as special NiP odds, contests, interviews with the players and exclusive behind the scene video clips. More similar stuff will most likely pop up shortly. It’s the biggest partnership as of today, and we’re predicting to see an increasing number of gambling companies investing in esports teams. Betway has recently given its website a facelift, and the result is quite impressive, a clean layout and fast navigation. It was a smart move to dedicate an entire section to esports since it makes it smooth browsing through all the games and odds. Once you’re in the section with esports you’ll notice a slideshow highlighting upcoming matches, best odds and offers. Just below the slideshow, there are a bunch of buttons and tabs where you can select your favorite games. CSGO is without question the most popular game to bet on right now, the fast-paced and straightforward action makes this game easy to watch and understand. The skins betting market for this game has been big for a while now, so the transition to legal bets with money was expected. At Betway you’ll find a deep selection of csgo odds: match winner, map 1 round 1, team to win pistol round and plenty more fun options which makes esports betting so much more entertaining. We also have League of Legends, the moba that has been dominating since its release in 2009. You’ll find daily exciting LoL odds to bet on; another player favorite is the mega-hit Dota 2. Now and then you’ll also see Hearthstone, Call of Duty, Street Fighter 5, Starcraft 2 and Heroes of the Storm. If you click on “Coupons” in the esports section, you’ll find every available title. A new addition to Betway’s sportsbook is NBA2K18, a basketball simulation game created by Visual Concepts. Online multiplayer battle royale games such as Fortnite Battle Royale and PlayerUnknown’s Battlegrounds are taking over the gaming world at a rapid pace. You’ll find both of these battles royale games in Betway’s sportsbook. Live betting on esports is a relatively new feature at sportsbooks; it’s only been around since like late 2016. Even though you’ll find live odds for CSGO, League of Legends and Dota 2 there’s still a lot to be done. We will hopefully get to see live odds for every esports game one day, such as Call of Duty and Overwatch. If there’s an area where Betway can improve, this would be it. But, with that said, it’s a minor issue since they’re one of few sportsbooks that even offer live bets. Nowadays it doesn’t matter if you’re at work, in school out on an errand, with mobile betting you’ll never miss a match. Simply just pick up your phone, browse your way to their website and choose esports in the menu. Thanks to their sleek layout you can, without effort, choose whatever feature or esports event that like. Most of us prefer using apps when we’re using our phones or tablets; luckily that is something that Betway acknowledges. You can download their app on either App Store or Google Play. Just like with any other sportsbook, you’ll find several safe and fast payment methods. Betway ensures you the safest transactions. And thanks to an auto-fill function, you won’t have to re-enter your payment info over and over again. One of the most common payment alternatives is bank transfer, but, you can also use Visa, Visa electron, Mastercard (withdrawal n/a), Maestro (withdrawal n/a), ecoPayz, Citadel Direct (withdrawal n/a), Zimpler (withdrawal n/a), Neteller, Paysafecard, EntroPay Card and Skrill. Whatever you’re comfortable with, please remember that you won’t be able to withdraw your winnings using Mastercard, Maestro, Zimpler or Citadel Direct, it’s recommended using any other method.